Creations of Art Huichol: choose what to bring as a souvenir of your step by Punta Mita! - DestinosFun! Creations of Art Huichol: choose what to bring as a souvenir of your step by Punta Mita! 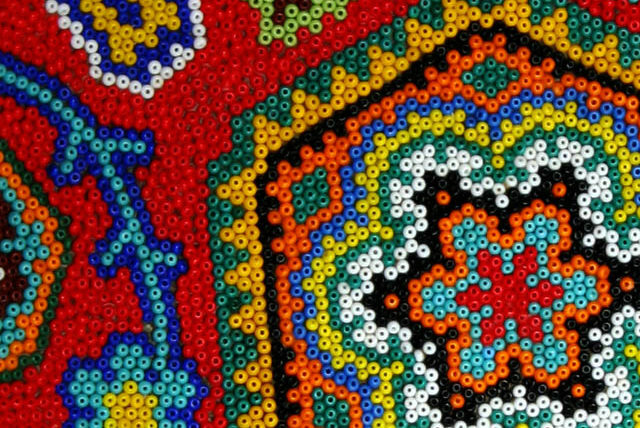 Creaciones de Arte Huichol, ¡elige cuál traer de recuerdo de tu paso por Punta Mita! With the patience of a craftsman and the persistence unmatched, that only have those who work in what you love, the Huichol people kept alive their art despite the passage of time and having lost the dominant position in the mexican society for years. Many say that art is the best way to understand the world, to express and to take possession of him. Art is one of the many ways that a culture has to perpetuate themselves in the time, not to die, to pass on their legacy from generation to generation, to make known what they believe, think and feel. The Huichol indians inhabit the Sierra Madre mountains to the north of Jalisco and parts of Nayarit; some also live in the centre north of Mexico, like San Andrés, San Sebastian and Santa Catalina. Fernando Benitez, the historian, anthropologist, historian and ethnologist, says that this tribe has been the only one able to keep his belief system intact, better than any other group in the country. Why? For several reasons, but mainly because the Huichol indians, before the arrival of the Spanish in the SIXTEENTH century fled to the mountains, a site that had no raw materials of interest to the conquerors, but only forests that became home to indigenous and natural balance. This cultural isolation has made their customs and traditions are intact; having a strong and pure system of culture, the handicrafts are a true wonder. The same materialized to perfection a critique of the world, an unmistakable way of saying: Here I am and I am Huichol! During your stay in Punta Mita, in addition to enjoy the beach, amazing sands, sparkling clear waters and take a moment to browse through the craft shops of the area and to immerse yourself into a cultural universe that is so fascinating and mysterious that you won’t want to leave him ever. –The masks. These, unlike the others that occur in other states are fully elaborated with accounts. So, small tubes of colour next to each other giving shape to the mask with the variation of colors. This technique was already used in pre-hispanic times when the accounts were made with bone, coral, turquoise and jade stones. – Yarn paintings. The colour is sensational and many of them represent religious practices that are specific to the huichol practiced for contact with the gods. –The urus. They are the artistic presentation of their gods. Some of them can be made with beads other with yarn, but always with the intense colors that characterized the art of this people. – Arrows to pray. They were used to make a request. Some claim to the divine request were thrown into the sky; others say that there is nothing better than to throw her down the river. Regardless of your use ancestral, the arrows of prayer will be the piece ideal for you take a piece of this culture. They are decorated with signs and pictures based on the order that you want to perform. Come to Punta Mita, mexico, and discovers a surprising cultural universe that was kept alive among the mountains of the Sierra Madre: come to Mexico and soak up the indigenous art!